Red Cluster bottlebrush in tree form makes a showy specimen, with its bushy, upright growth habit and bright red blooms. 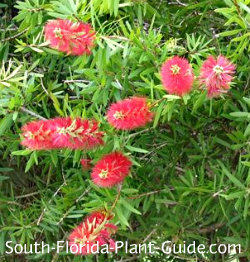 This bottlebrush shrub variety can be grown as a large bush or a small single-trunk or multi-trunk tree. A Red Cluster bottlebrush works very well as a specimen tree for a yard with limited space. Its upright rounded crown can be easily kept in check for a manicured look. The flower spikes shaped like a bottle brush appear on and off all year - more in warmer months - and attract hummingbirds and butterflies. A great landscape accent plant, this bottlebrush tree is perfect for the corner of the house or near the entry - though not too near, honeybees love the red flowers. Other varieties of bottlebrush include the Red Cluster in full-to-the-ground bush form, weeping bottlebrush tree, and dwarf 'Little John' bottlebrush bush. Fast growing to 10 feet or more, Red Clusters are cold hardy, doing well anywhere in South Florida. A full sun location is best. The soft-textured foliage is evergreen and the plant is moderately salt-tolerant. It's also said to be deer-resistant, though nothing is deer-proof. If you prefer the look of a single trunk Red cluster bottlebrush, buy it already trained this way from a nursery. For multi-trunk, however, you can buy it in bush-form and train it to tree-form by trimming off new shoots at the base. Fertilize in spring, summer and fall with a top quality granular fertilizer, and supplement feedings with bone meal and/or liquid fertilizer to promote heavy blooming. Red Clusters tend to stay full to the ground, so clean up the trunks on a regular basis to keep the tree shape. Although this plant has a nice, naturally rounded shape, you'll need to cut off stray shoots occasionally for a cleaner look. 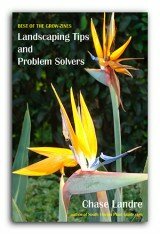 Cut back hard in spring (late March) - take off up to 1/3 of the plant to encourage the dense and bushy growth. 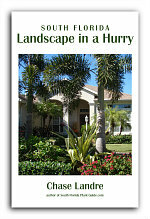 Give it a good drink at least an hour prior to doing any hard pruning. 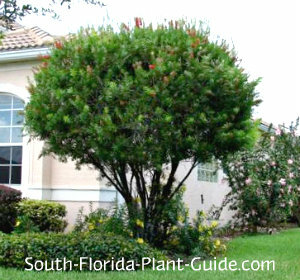 Plant 5 feet from the house to allow the wide, rounded crown of the tree plenty of room the fill out. If you're planting more than one, such as a row of trees along the property line, space them about 8 feet apart so each one can stand out. Red Clusters do best in the ground rather than in containers. COMPANION PLANT SUGGESTIONS: Underplantings should be kept low to show off the Red Cluster's pretty tree form. 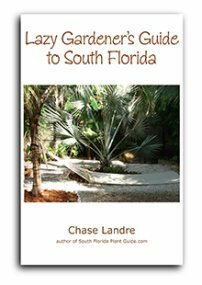 Try small shrubs such as Mammy croton, Indian hawthorne and dwarf allamanda, and/or groundcovers such as sweet potato vine, coral creeper, jasmine minima (Asiatic jasmine), and dwarf ruella.